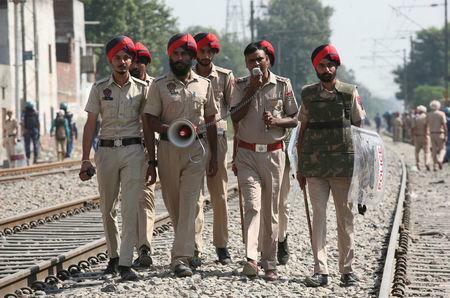 AMRITSAR, India (Reuters) - An angry mob threw stones at police on Sunday near the site of a deadly railway accident in north India, demanding immediate financial compensation for the families of the victims and government jobs for those who lost wage-earners. A group of about 100 people staged the protest in the northern city of Amritsar where a train plowed through a crowd gathered to watch the burning of effigies and a fireworks display on Friday as part of a Hindu festival, killing 59. Many of the victims were either on the railway tracks or near them and did not hear the commuter train coming in the noise of the crackers and giant effigies burning in the darkness, witnesses and officials said. Relatives of the victims have turned on the railways for allowing the train to go through when there were scores of people near the tracks. The railways said they were not informed about the plans and that people should not have been standing near the tracks. On Sunday, relatives and locals gathered at the accident site and began throwing stones at police, saying there was no help coming for the grief-stricken families. "Down with the government," a youth shouted, while others lunged toward police constables guarding the site, where an inquiry has been ordered. "They should give the close relatives of the dead and the injured government jobs. They should also make sure they get the compensation quickly. Nobody has received anything till now," said Ravinder, one of the protesters who only gave his first name. Police charged at the stone pelting mob with sticks to disperse them. Amarinder Singh, the chief minister of Punjab, the state where the accident took place, announced compensation of 500,000 Indian rupees ($6,815) for those who lost family members and free treatment for those injured in the accident. But such compensation often takes months or even longer in reaching the families. Shops were shut across Amritsar, to mourn the victims of the latest disaster to hit the railways, one of the most deadly in years. Data from parliament in July showed that 49,790 people were killed by trains in India between 2015 and 2017. A railways official said the driver of the train told authorities he had applied brakes and honked on sighting the crowd near the tracks, but was not able to stop the train on time. Amrit Singh, the director of the railway station at Amritsar, said a commuter train traveling at 90 km per hour (56 miles per hour) would travel for 700 meters (765 yards) after the brakes are applied before stopping. "In this case, the driver had just 200 meters, or less. There is no way he could have stopped the train," Singh said.